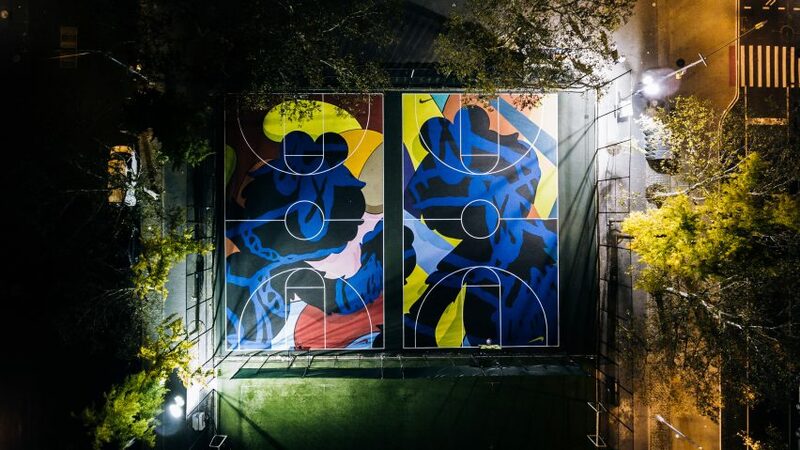 Nike has enlisted Brooklyn-based artist Kaws to paint his signature motifs across two basketball courts in New York City. The artist – who is known for his brightly coloured, cartoon-like works and limited-edition objects – covered two side-by-side courts on Manhattan's Stanton Street. The project is part of the sportswear giant's latest campaign, New York Made, which will see a series of community collaborations and interventions across the city. Kaws, whose full name is Brian Donnelly, lived on the corner of Clinton and Stanton Street in the 90s. He would walk past the courts every day, making this intervention a personal and somewhat familiar experience. "My approach to the courts was very similar to how I would work on canvas," he said. "I wanted to create something that was true to my language but also considerate of this being a court that people are playing on." "I wanted to find the sweet spot where it works visually and functionally — how its broken up by the game's lines and works with my images." The artist used bold lines and shapes to colour the courts, which feature an abstract version of his Elmo and Cookie Monster BFF designs – both with his signature crossed-out eyes. "I always think about when I was young and the things I had interaction with, whether it was skateboard graphics or magazines, and how art reached me," he said. "I like the idea of public art because it reaches people in a casual way, and when they aren't necessarily looking for it." The New York Made: Stanton Street Courts by Kaws is located at Sara D. Roosevelt Park in Manhattan's Lower East Side. Other unusual sports courts and pitches include a multicoloured basketball court between a row of buildings in the 9th arrondissement of Paris and a series of irregularly-shaped football fields in Bangkok.